In its second year, Drop Your Drawers’ amazing success was felt well beyond Campbell County. 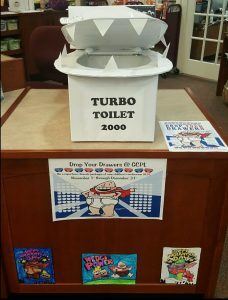 Gallatin County Public Library collected Drop Your Drawers donations in Turbo Toilet 2000. Building on the inaugural Drop Your Drawers in 2015, Campbell County Public Library took the program statewide in 2016, with an assist from author Dav Pilkey’s Captain Underpants character. 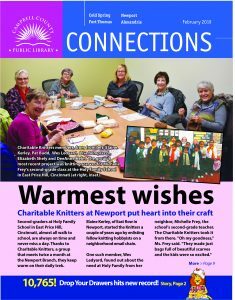 With “the Captain” leading the charge on signs and posters, libraries throughout Kentucky joined the drive, which collects boys’ and girls’ underwear packages to replenish local elementary schools’ emergency supplies and assists their Family Resource Centers. Locally, your generosity helped us raise 6,908 pair, well past our goal of 6,000, which were delivered to Campbell County public elementary schools. Statewide, an astounding 27,150 pair were donated. The need is great. Because parents are often unable to bring fresh underwear to their children during school hours, children can miss valuable learning time, especially as schools struggle to keep their supplies of emergency underwear from running out. Thanks to you, children in Campbell County and throughout Kentucky benefit.